I’m taking a cue today from a recent blog post by the excellent Jen at Rue & Hyssop entitled “Little Witcheries,” which focuses on the small, everyday enchantments in her life. 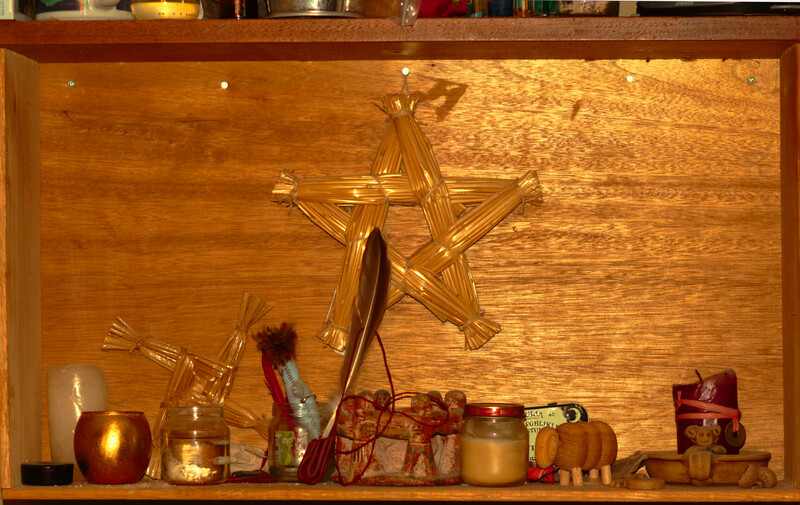 She and several other bloggers have been sharing their daily practices, household charms, and domestic talismans so I thought I would offer a bit of the same. I know I don’t tend to make posts entirely personal here, but I do frequently talk about the “secrets in plain sight” that accompany practical witchcraft and folk magic, so it seems like now is a good time to do a quick tour of my home and see how I apply what I have learned in the course of my studies to my real life. I hope you won’t mind the diversion from the more general and academic examinations of folk magic. You’ll still likely get a good feel for folk magic, and I’ll reference any previous posts or sources that might explain further, so hopefully this won’t feel too indulgent. I’ll mostly be cataloging what sorts of “little witcheries” I have around, rather than giving a lot of expository detail. Basically, I’m treating myself and my home as a folklorist’s test case, because nothing’s more fun than turning the microscope on yourself, right? And so, on with the tour! Come on in! Plant guardians – I have a number of magical plants in my front garden, but my rosemary and rue plants act as my primary sentries. The rosemary started as a pair of six-inch cuttings, and now it’s easily a three-foot-tall shrub. 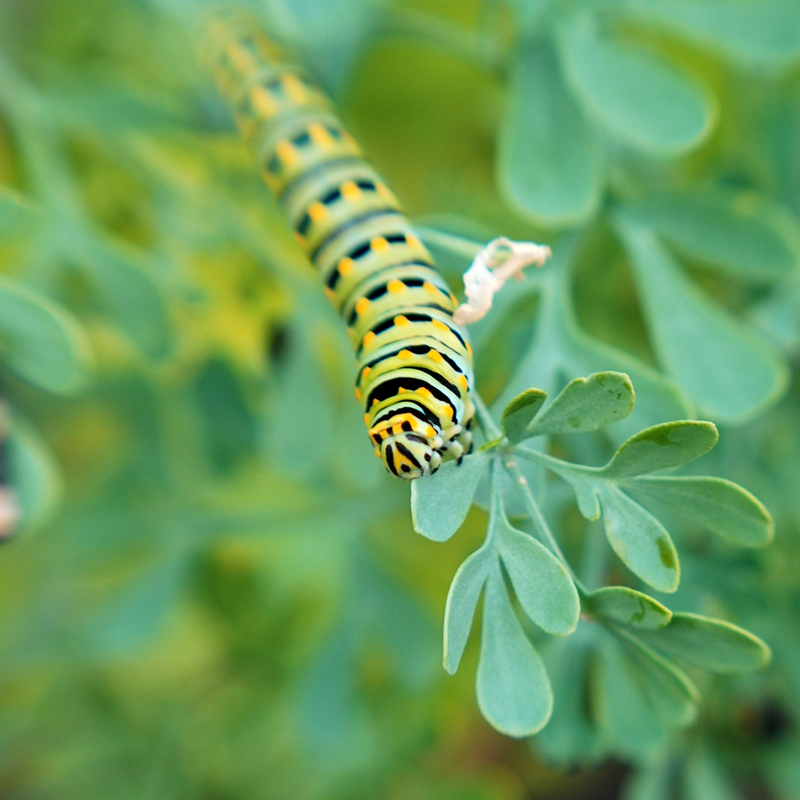 Theswallowtail caterpillar in the pictures is one that seems to particularly like our rue plant, but it doesn’t do any real harm to it, so we let it alone. Witch bottle – Buried somewhere along your way to the front door (exactly where is my little secret). Washes – The door is washed with protective mixture (which Laine has indicated she would rather not touch) and I use a protective foot-wash derived from Irish lore on the porch. Entrance – Door has salt & red brick dust lines, plus several paper charms wedged in the lintel. Cleaning – We have a mostly carpeted space, so instead of floor washes, I sometimes make floor sprinkles with powdered herbs & salts to affect the various rooms. I also use vinegar (including Four Thieves Vinegar) for cleaning & breaking up bad energy. Most of what I do to dress doors, windows, etc. can be found in our posts on magical house cleaning. 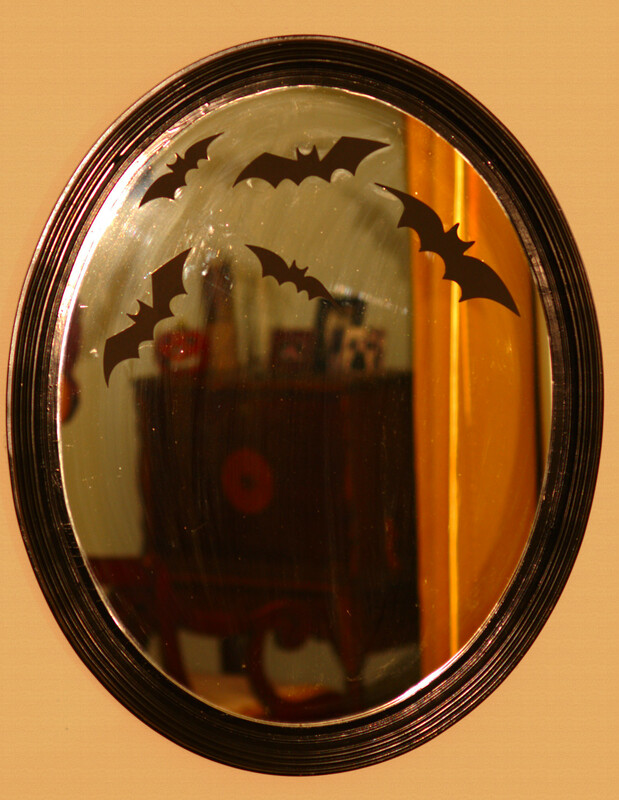 Mirrors – We keep a mirror behind the door to deflect anything spiritually harmful (currently decorated for Halloween with some bats). Kitchen – I’ve always got something brewing. 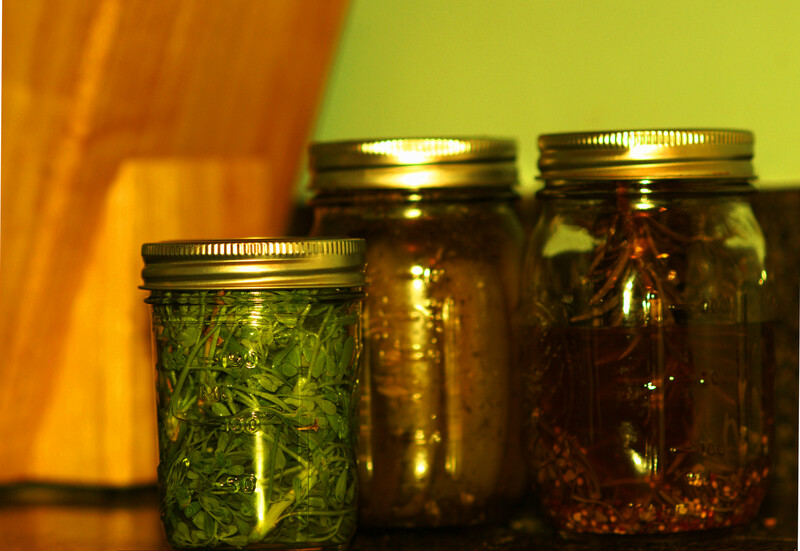 Right now I’ve got some tinctures going (some magical, but most multipurpose, used in magic or cocktails equally), a few herbs drying in bags by the windows, and of course, my Four Thieves Vinegar in the pantry (plus a couple of jars of Four Thieves Pickles, which I put up each year). 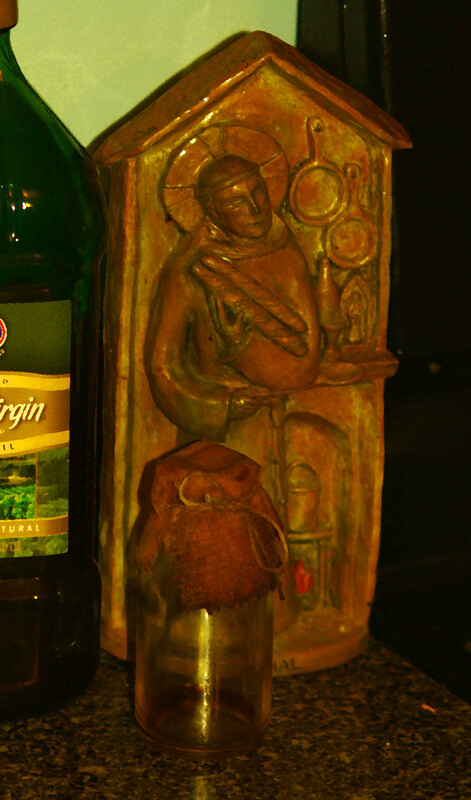 The kitchen is also home to a few of my spirit helpers, including St. Pascal and my resident house spirit (his bottle may look a bit strange, but he’s been with us almost since we moved in, so I don’t mind his scruffy appearance). 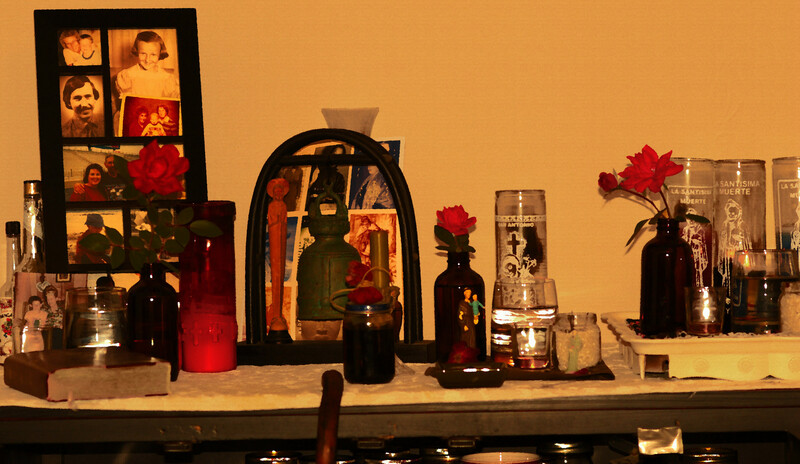 Altars – I’ve got altars throughout the house. I have a personal altar in the bedroom where I do daily devotionals, and then the main altar in my upstairs office for my weekly communion with my spirit friends and family. 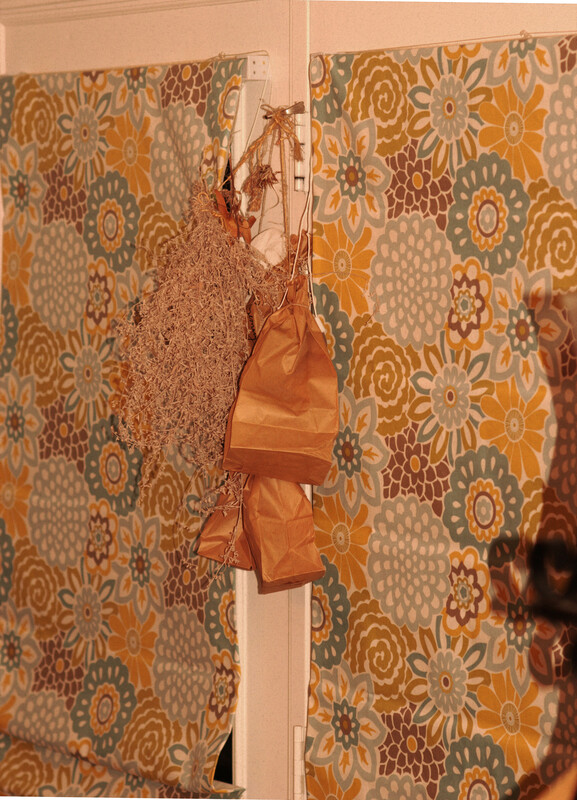 Brooms – I keep brooms near our main entrance doors, bristles up to ward off unwanted visitors. Cards – Are just everywhere in the house. I collect different decks that interest me, though I have a few favorites for divination. 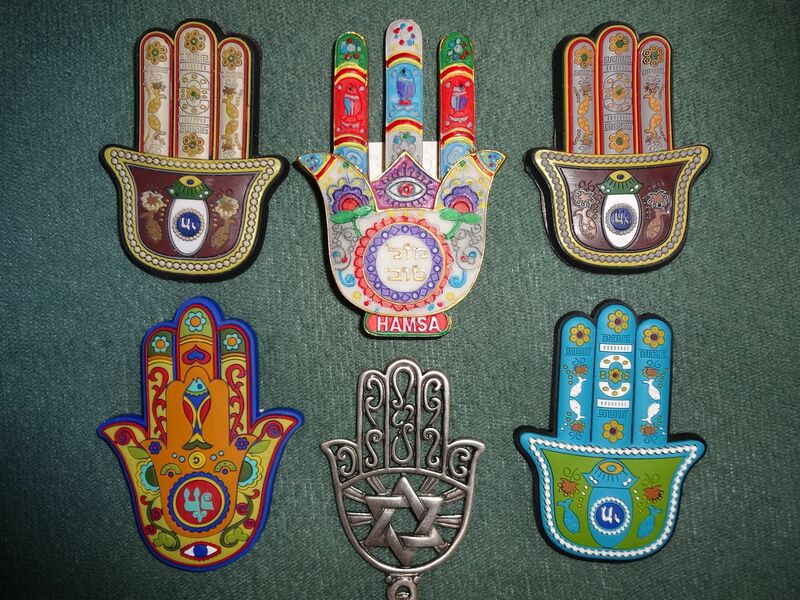 Talismans – I keep a hamsa hand on one of my windows, iron railroad spikes throughout the house (some are visible in the picture of the library shelves), and I will sometimes place small talismans like evil eye beads or saint medallions near the office and the children’s room to ward off any harsh or unwelcome spirits. I’ve also got an Ojo de Dios my mother acquired in New Mexico which acts as a protective charm in the nursery. Library – Not a lot of folk magic, per se, but lots of information on it. I tend to collect chapbooks as well as full print editions. I also keep my herbal & gardening library in here (not visible from this angle), along with most of my dried herbs. I usually have something hanging to dry in here as well. A few small charms are floating around, as well as many of the spell ingredients I turn to frequently (oils, herbs, etc.). I keep most of my folklore and fairy tale library near this one, as well. So that’s the tour for the day. I hope it wasn’t too distracting of a diversion from the typical examination of folk magic, but I was so enticed by the series of posts I saw emerging from Jen’s topic that I couldn’t resist. I will likely be using my next post to do a similar “tour,” but of a non-personal space in the interest of showing how many folk magicians acquire ingredients without necessarily having a “witchy shop” nearby. Until next time, thanks for visiting, er, reading! This entry was posted on September 16, 2013 at 1:35 pm and is filed under Blog, Practice & Technique. You can subscribe via RSS 2.0 feed to this post's comments. Thanks for sharing your witcheries! 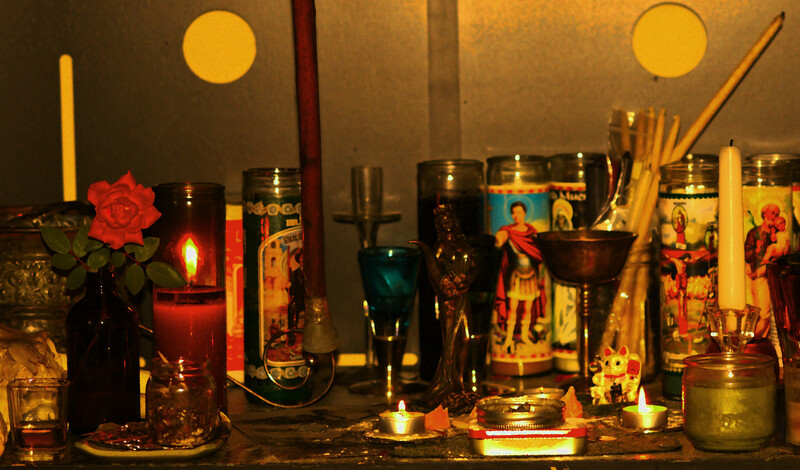 I knew you would have fabulous altars and mystical things tucked here & there. I also have a foolishly large rue in the front garden, but it housed a praying mantis this summer instead of a lovely caterpillar. Also – I think it may be time for a recipe swap! Four Theives pickles sound awesome. I’ll bet colds are short-lived in your family if the kids eat those! Is your front door haint blue? I love your blog. I just started going through all your old posts and am fascinated to the conjure and rootwork posts. It is becoming clear that thi is my path and since I’m in savanna ga, I might do well here 🙂 much love from GA.